The deadline to apply for a seat on the Measure N panel has now come to a close with a total of 87 applicants entered, according to the City Clerk's office. 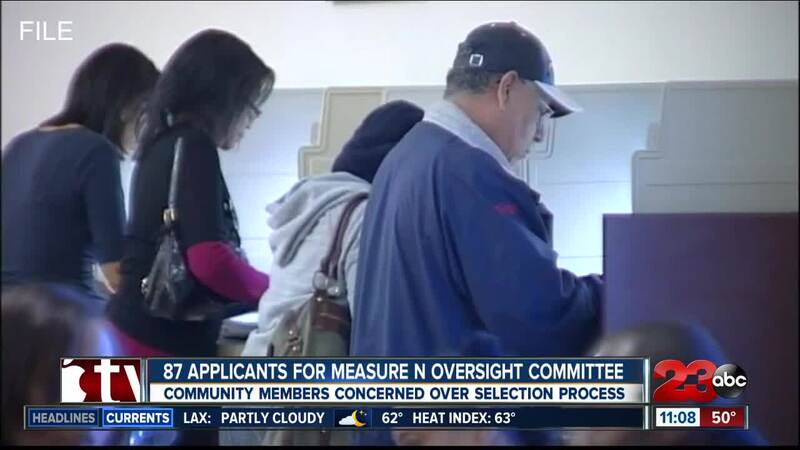 BAKERSFIELD, Calif. — The deadline to apply for a seat on the Measure N panel has now come to a close with a total of 87 applicants entered, according to the City Clerk's office. Now, city officials will begin to work on selecting the oversight committee. Measure N, a one-cent sales tax, narrowly passed last year in Kern County and officials said that the measure could provide tens of millions of dollars for local public safety and community welfare programs. Officials will work now to select nine people from the 87 applicants to be part of the committee and will help decide how the funds are spent. City Councilman, Andrae Gonzales, an early advocate for Measure N says this measure provides much-needed money to the city. “[It will] improve public safety, respond to the growing homelessness situation, in our community and improve the quality of life for all citizens in Bakersfield,” Gonzales said. Some community members are worried that the City Council will unfairly prioritize applicants who belong to certain organizations over other applicants. “It says in there that this is supposed to be an independent community-based committee well now that’s not what it’s looking like,” said Maxwell. The application states that certain organizations such as the Greater Bakersfield Chamber of Commerce and the Kern County Taxpayers Association are encouraged to nominate members, but it does not say those nominees will receive special consideration. Councilman Gonzales says that Measure N indicated that this would be the case on the ballots, saying those individuals will not be guaranteed seats, but rather the council wanted to make sure individuals with relevant experience were applying. Upon reviewing a sample ballot provided by the Kern County Elections office, 23 ABC did not find that information explicitly outlined in the document. The Committee’s power is limited to making recommendation on how the money should be spent, but ultimately City Council will have the final say. “The ultimate decision, let’s be frank, goes to the City Council. The Council is the body that will approve ultimately the budget for Measure N,” said Gonzales. The deadline to submit an application for the Committee was today at 5 p.m.
Each member on the City Council will make 9 selections, and any selection with at least four votes will be given a seat on the Committee. This process will continue in rounds, so to speak, until each seat is filled. City council will announce its selections on February 6.